The drawing for Measure 31 Design 8L for LST and similar ships dated December 22, 1943. The specified vertical colors were dull black (BK), ocean green (5-OG), brown (4-A) and haze gray (5-H) with navy green (5-NG) and glossy black deck paint on horizontal surfaces. 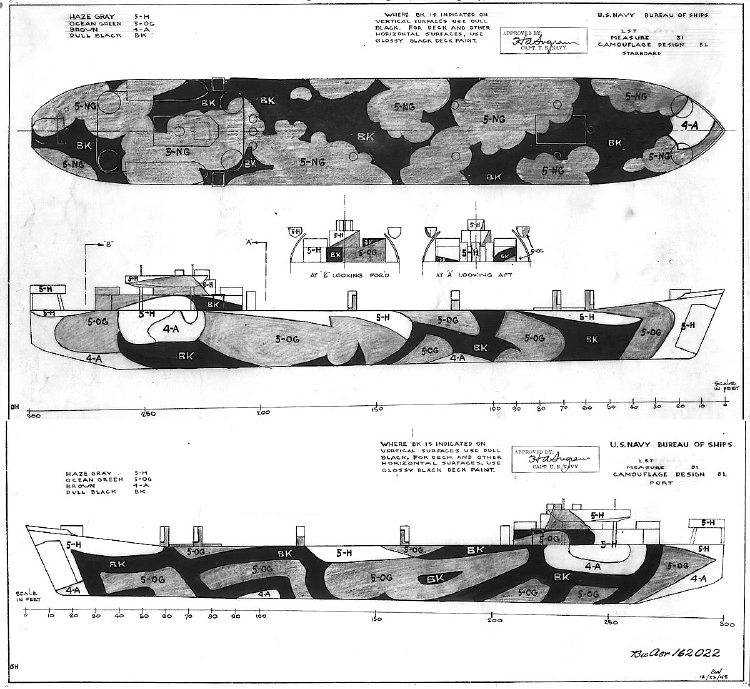 The first drawings of Design 8L was for LSTs on December 22, 1943, as above. Then drawings for Design 8L for the LCI(L)-351 class were drawn using Measure 31 and Measure 33 colors on December 31, 1943. Original drawing source: NARA 80-G-162022 and 80-G-162023.